Seeking to sponsor the event? The 1st and 2nd editions were really successful and we plan our 3rd edition to be even better! Last year only, we had the pleasure to greet over 5000 visitors from our local community to out of staters! The Top Notch Car Show in Pahrump, NV, has got an high mark from participants and partners, and it is growing every day. 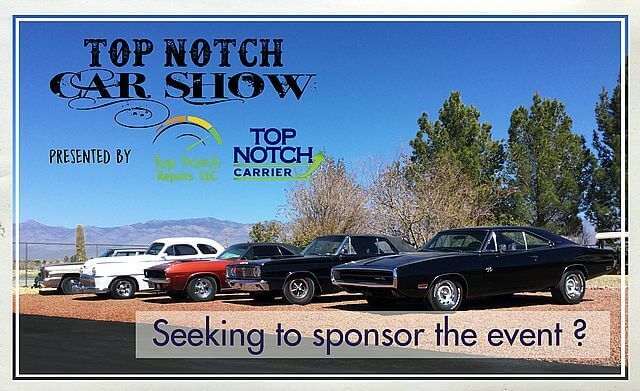 Are you seeking to sponsor the Top Notch Car Show ? We will advertise your brand on our website and social medias, and you will be announced at the show. You can participate by doing anything you can think of, monetary donation, products from your business, gift certificates, gift baskets. We are also putting goodie bags together, if you want to give items with your logo on it. If you are interested to receive flyers to promote the event in your circle, please let us know and we can mail you some. If you have any further questions, you can always call us at the office at 775-751-1007. Thanks, and looking forward to have you on board! Click/Tap the icons below to share this website URL to your friends.